This is one of my favorite menus in Warung Arema, Pujasera, Batam island besides Tahu Telur dan Nasi Rames. I've had it often together with my ex colleagues as our delicated lunch in the middle of our busy days. And after 4 years leaving abroad finally I have tried to call back my memory and came out with this recipe. The result was too spicy ha hah. 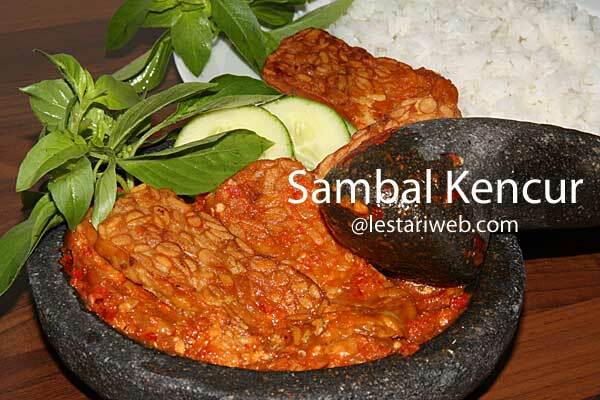 Important Tips: Prepare the sambal shortly before serving to reserve it's best taste. 1Heat a little bit oil. Fry the garlic until soft and light brown. 2Put the chillies, garlic and lesser galangale in a mortar / grinding stone and grind until smooth. 3Add the chopped tomato and roasted shrimp paste, grind them again. Stir to mix. 4Adjust the seasoning, add the salt & sugar (if necessary). 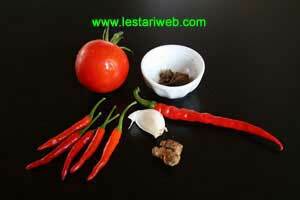 5Serve right away with rice, bruished fried tempe or tahu and raw vegetables / lettuce.